If you’re like many small business owners, you are probably using a mobile device (or two or three) as part of your day-to-day routine. With the advent of mobile applications that can do everything from transfer money to monitor security cameras, mobile devices are now fully integrated into the business world. According to a Cisco whitepaper, by the end of 2013, the number of mobile-connected devices will exceed the number of people on earth, and by 2017 there will be nearly 1.4 mobile devices per capita. 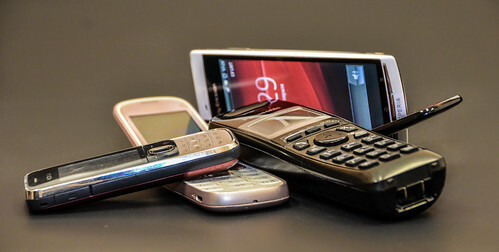 A Sophos Survey found that the average American carries two mobile devices, while the average Australian carries five. Socialnomics reports that the average person has their mobile device in reach 14 hours per day. Venturebeat reports that Americans spend an average of 158 minutes every day on their smartphones and tablets. Smartphones and tablets have made conducting business on the go easier and more convenient. As a result, we are storing more and more critical business information on them such as contact lists, financial information, and confidential email. Thus, it is surprising that people do not take even the simplest steps to secure the information stored on their mobile devices. According to a recent Consumer Reports study, only 8% of people encrypt their phones and only 13% use a long secure password with a screen lock. 23% do lock their screen with a 4-digit pin, but 64% use no password protection at all. That adds up to a huge potential for unauthorized access to personal and confidential business data in the event your phone is lost or stolen. (According to Consumer Reports, in 2012, 7.1 million phones were irreparably damaged, lost, or stolen and never recovered.) So, what can you do to protect your data? You can encrypt your phone’s contents, install anti-virus protection, pay attention to the permissions Apps request when you download them, only download Apps from trusted marketplaces, and regularly back up your data. The simplest thing you can do is to set your screen lock and use a strong password (at least 8 characters with letters, numbers, and special characters). So, if you haven’t set a strong password for your mobile device, take a couple of minutes to do it right now. If you’re not sure how, watch this short video from Consumer Reports to see step-by-step instructions for Android and iOS devices.